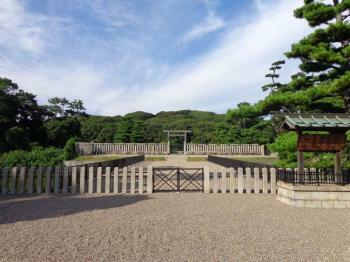 Mozu-Furuichi Kofungun, Ancient Tumulus Clusters is part of the Tentative list of Japan in order to qualify for inclusion in the World Heritage List. In 2014 I visited the centerpiece of this nomination, the Daisen Kofun, which is considered to be the grave of Emperor Nintoku and is the single largest grave in the world by area. It is so large that the best way to view it is perhaps to take off or land at the Kansai (Osaka) International Airport. The photo shows the Shinto Torii Gate in the middle, behind which lie the triple moats that surround the all important keyhole-shaped grave. I believe this site has a long way to go before being inscribed on the WH list, simply because, no matter what the nomination dossier says, nobody is certain that the Daisen Kofun is really the grave for the Emperor. This absurdity comes from the fact that the belief that the grave belongs to an Emperor means it is managed by the Imperial Household Agency, an ultra conservative entity that wouldn't allow anyone to visit such a holy site, let alone to dig it, resulting in the uncertainty. (Remember that the Japanese Imperial Family is considered to be the descendants of Amaterasu, the Sun Goddess, in the Japanese mythology.) I was told by a man who managed this property on site that the Ministry of Culture, which takes care of the World Cultural Heritage in Japan, had been unsuccessfully battling it out with the Imperial Household Agency, which takes care of the past and present living deity!